Beginning tomorrow, January 30th, I will be starting my 10 Days of Valentine! Please join me for the next 10 days as I will be posting, every day, a Valentine’s Day related post! 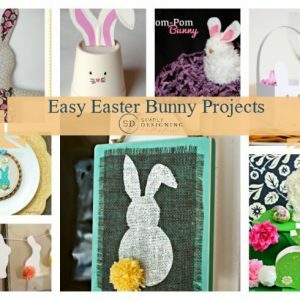 Some of these will include free printables / downloadables, recipes, gift ideas etc. It is sure to be a lot of fun and it should help all of us to get into the Valentine’s Day spirit! To get us started, look at these fun ideas! 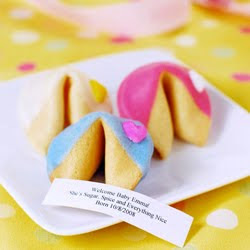 Valentine’s Day fortune cookies! The ones shown here can be customized for any occasion from the fortune to the color at Beau-Coup. But how easy would these be to make for the DIY-er? Dip the fortune cookies half way in the chocolate! While the chocolate is still drying, you could place a conversation heart or a red hot heart on there to create the ultimate in Valentine’s Day good fortune! 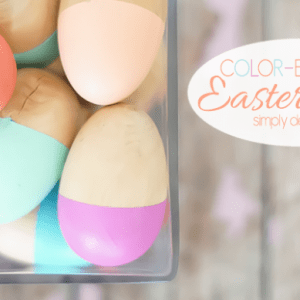 I found this super cute idea at Hello, Good Gravy! 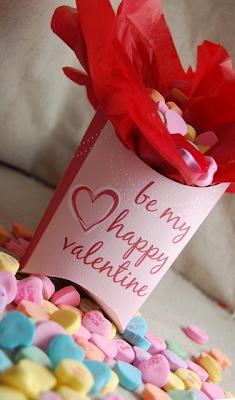 It is a printable Valentine’s Day Treat Box. You download the design here, cut and assemble for a truly unique Valentine and treat package all in one! Original idea, printable and photo found here. Hope to see you soon for the 10 Days of Valentine! « Paper doll FREE Printables! Thanks for visiting Barbara Jean! The 10 Days of Valentine are underway! Check out the latest post at: http://www.simplydesigning.blogspot.com<br />Thank you! Lori, thanks for visiting my blog! I hope you enjoy the valentine&#39;s day posts!